Portage Flyer back under steam ! July 1st 2011 saw steam return to the Portage Flyer ! Pulled by locomotive number 2, visitors were once again thrilled by the sound of a steam whistle as the Flyer left the station and headed for Fairy Lake. Due to the construction of the new Canada Summit Centre next to our facilities, the train did not operate in 2009. The train returned to operation on July 1st 2010, pulled by our 1948 vintage diesel-electric locomotive. 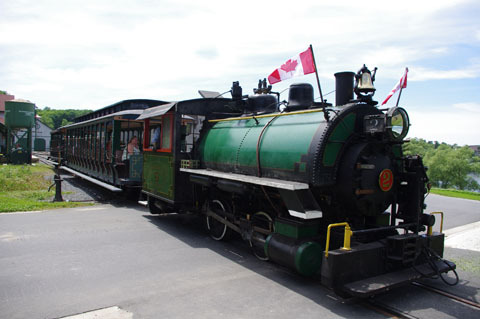 With its boiler newly re-certified, locomotive number 2 has returned to pull trains for July and August. The Pioneer Village and the Muskoka Museum also open. Please check the Muskoka Heritage Place website for more details.